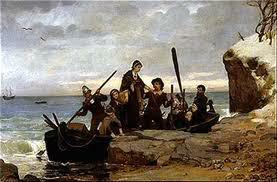 The first winter the Pilgrims spent in Plymouth was an extremely difficult one. 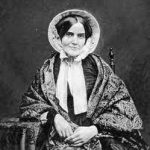 Nearly half of the passengers who made it across the Atlantic died in an epidemic, including Mrs. Chilton, leaving thirteen-year-old Mary an orphan. 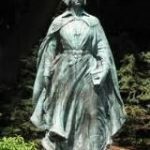 Which family raised Mary after her mother’s death has not been determined, but in 1623, at the age of 16, Mary received her share in the Division of Land as a Mayflower passenger. She also received an unknown number of cattle in the 1627 division of cattle. 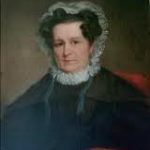 Sometime between July 1623 and May 1626, Mary Chilton married John Winslow, who had arrived at Plymouth Colony in 1621 on the Fortune. Their first child was born in 1627. They had a total of ten children together: John, Susanna, Mary, Edward, Sarah, Samuel, Joseph, Isaac, an unnamed child who died young, and Benjamin. Sometime after the birth of their last child, the Winslow family moved to Boston, Massachusetts and transferred their membership from Plymouth to the Third Church of Boston in June 1671. John Winslow became one of the wealthiest merchants in Boston. He and Mary lived in the house in Boston until their deaths. John died in the spring of 1674 and bequeathed Mary their dwelling house, gardens, yards, all household goods and £400 sterling. Mary Chilton Winslow died in May 1679. Both John and Mary are buried in King’s Chapel Burying Ground in Boston, Massachusetts.